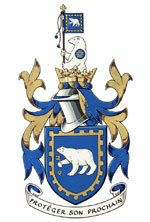 The polar bear, present in the shield and crest, is the animal that best personifies Mr. Bissonnette. Polar bears are tremendous hunters that, much like police officers, work in hostile territories in pursuit of their goal. Although peaceful by nature, polar bears do not hesitate to defend their territory and cubs. The polar bear also refers to Mr. Bissonnette's place of birth and residence, Montréal-Nord. The key being held in its paw is a symbol of the city's openness and of the past, which represents Mr. Bissonnette's work as a police officer and historian. 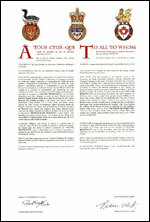 The shield also includes a crenellated edge symbolizing the city territory and the protection of citizens. It also recalls that Montreal used to be a fortified city. In the crown of the crest, the fleur-de-lis represents Quebec and the French origins of the first Bissonnette, native of Vendée who arrived in New France in 1658. The clover is a reference to Mr. Bissonnette's maternal family, the Callaghans from County Cork, Ireland, who immigrated in the 19th century. The maple leaf represents Canada, the country that welcomed both families. 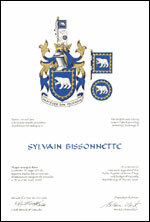 The polar bear in the crest has a blue disc on its shoulder adorned with the emblem of the Service de police de la ville de Montréal. This star-shaped emblem has been used for many years on uniforms and other objects. In Mr. Bissonnette's case, it evokes the quest for excellence. Meaning "Protecting one's fellow man". The symbolism of this emblem is found in other element(s)of this record.